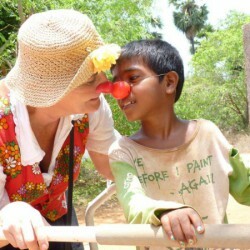 Two clowns came to the children’s home and to the Ananda Day Care in May 2014. The clowns come from the Global Clowning Foundation, these clowns especially visit developing countries. They love to bring happiness and lightness to the places where it is needed most, like in slums, hospitals, and projects like Isai Ma(i)yam. With their merriness they hope the children can forget their problems, pain and sorrow for a little while and can just laugh a lot. It was really a big success, the children loved it!